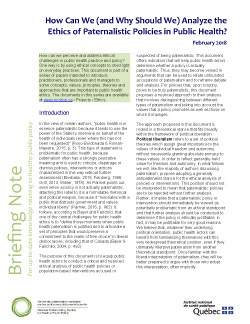 Home > How Can We (and Why Should We) Analyze the Ethics of Paternalistic Policies in Public Health? How might we conduct an ethical analysis of policies that are called paternalistic? In the final, more practical, section, we offer a three-step approach to conducting a more nuanced ethical analysis of population-based policies or interventions that are accused or suspected of being paternalistic.